It's a gray rainy day in Houston today. I've had a rough day. Lots of challenges facing me personally and professionally. While flipping through some photos I came across one of my all time favorites. 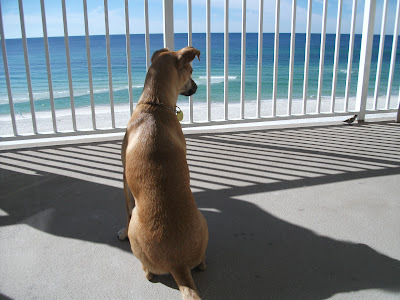 This is Cooper Brown Dog sitting on the balcony over looking Panama City Beach. Just the sight of little Cooper checking out a little bird with the big blue sea in the distance perks me up. Thanks Coops and thanks to day dreaming on a sunny beach. This gave me a needed picker upper.